Fast casual Mexican restaurant stocks: Jim Cramer takes a look at the charts with colleague Bob Lang. Just as retail stocks are beginning to benefit from strong employment figures and tax cuts, shares of restaurant companies are also beginning to move. To find out how to play them, Jim Cramer dedicated his "Off the Charts" segment on Mad Money Monday to looking over the charts with colleague Bob Lang, the founder of ExplosiveOptions.net, and a contributor to TheStreet.com's Trifecta Stocks newsletter. Lang told Cramer he particularly likes the charts of three companies that run Mexican fast casual restaurants. He says shares of Chipotle (CMG - Get Report) , Del Taco (TACO - Get Report) and El Pollo Loco (LOCO - Get Report) should outperform the restaurant group as a whole at least through this fall. Lang and Cramer started by looking at the chart of Chipotle. The one-time high flyer suffered a series of health scares in 2015, which undercut the stock severely. Late last year the stock was hit by yet another healthcare issue. When the market sold off hard in early February, Chipotle fell to $247. It was a $750 stock in 2015. Since February the stock has recovered, having reported a strong quarter in late April. It jumped sharply after the report and has been showing strength ever since. Lang notes the Relative Strength Index, or RSI, an important momentum indicator, has been in positive territory since the report. In recent weeks the stock has been trading sideways, consolidating its earlier gains. But Lang thinks it could finally be ready for the next leg higher. Lang also likes how the volume trends have improved. For technicians, volume is like a polygraph: strong volume means a move is legitimate and weak volume means a move is lying. In Chipotle's case, the stock has had very strong volume on up days, which suggests to Lang that this run is the real deal. 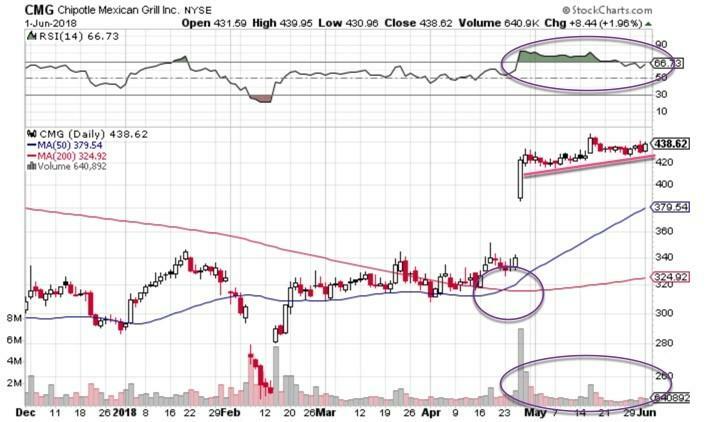 Chipotle is Lang's favorite stock in the group and he thinks it can rally to $480 and then perhaps even $500 in the not-too-distant future. Lang and Cramer next looked at Del Taco, a speculative, small-cap Mexican chain with more than 300 locations across 14 states. Shares fell as low as $10 in March. But since then they have caught fire, and are now up 20% since the March lows. Lang likes this chart because the Relative Strength Index has been moving steadily higher along with the stock price. He also notes the Moving Average Convergence Divergence, or MACD, indicator, which helps technicians detect changes in a stock's trajectory, made a big bullish crossover in April, where the black line crosses above the red one. Since then, it's gotten more positive. Of course, the stock has roared higher over the same period. Lang believes that Del Taco could have more upside. While the stock is approaching the ceiling of resistance from where it gapped down in March -- at $12.50, right near the 200-day moving average -- Lang believes it can make a run at that level and then push higher. As he sees it, the path of least resistance takes Del Taco to just under $14, up roughly 13% from these levels. Lang and Cramer next looked at El Pollo Loco, another small-cap Mexican chain. Lang likes what he sees on LOCO's longer-term weekly chart. Again, like the other Mexican chains, LOCO had a rough time earlier this year, but seems to have bottomed in recent months. The stock recently made a run at its 50-week moving average, where it met a ceiling of resistance and the rally stalled. However, based on the action Lang thinks this could be a wild card for upside. 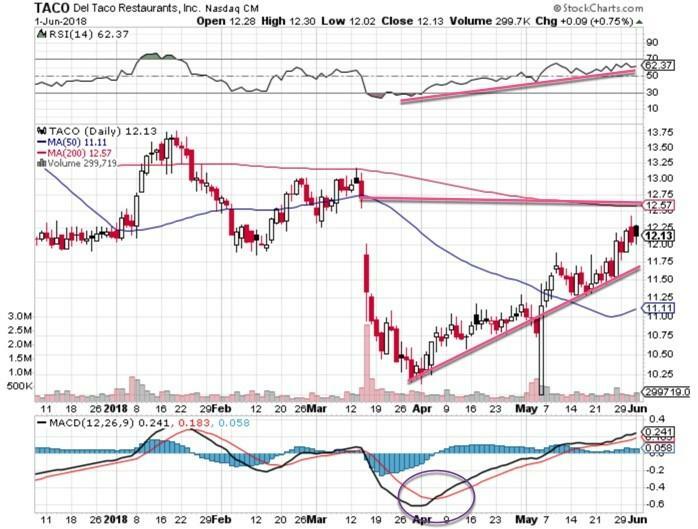 He notes that El Pollo Loco recently made a higher low -- a good sign -- and that volume trends have been improving, meaning the volume is higher on up days than down days. Meanwhile, the Relative Strength Index keeps climbing, and in April the Moving Average Convergence Divergence indicator flashed a buy signal that's still in effect. 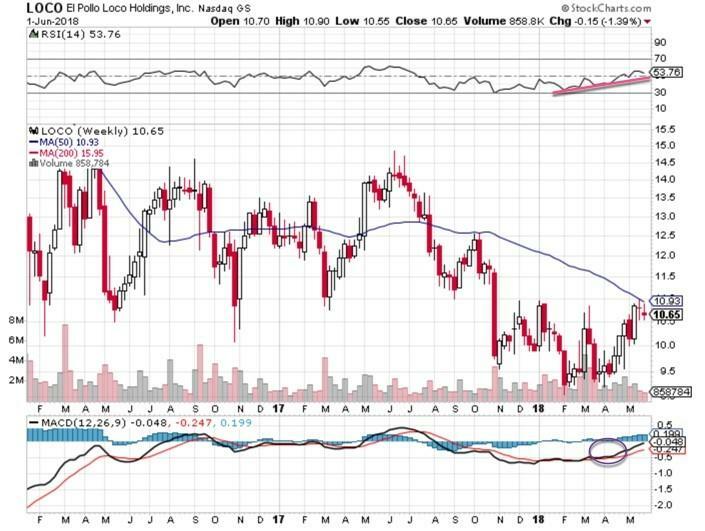 Lang thinks that El Pollo Loco can break out above its ceiling of resistance and make its way to its 2017 highs of around $15, which would represent a 40% gain from current levels.